My son isn’t interested in television. Don’t get me wrong; he watches television. Archer, who’s 9, likes game shows and sports, and he’ll watch a Christmas special or two when it’s that time of year. He used to be a devotee of Bill Nye The Science Guy until he watched all the episodes twice and decided to quit on it, and he watches Pokémon every morning at breakfast with his 6-year-old sister Cady Gray, though he’s usually only half paying attention. When we go on long car trips, he has DVDs he prefers to watch—mainly Schoolhouse Rock and They Might Be Giants—but he’s not into movies, because as he puts it, “A movie is a video that is too long and too loud.” So Cady Gray is my movie date when I want to go see Tangled or How To Train Your Dragon, and if we’d let her (which we don’t), she’d happily lie down in one of our big, cushy recliners and watch cartoons all day. Meanwhile, from an early age Archer has found the world of kid-friendly entertainment a perilous one, full of sudden noises and flashing lights and breathless motion, all of which can make an already confusing world even harder to process for someone who’s autistic. In mimicking what he saw on Blue’s Clues, my son was merely following the show’s intent. Blue’s Clues debuted in 1996 on Nickelodeon after years of research and development, supervised by producers Traci Page Johnson, Todd Kessler, and Angela C. Sontomero. In the Heather Hendershot-edited essay collection Nickelodeon Nation, University Of Massachusetts psychology professor Daniel R. Anderson writes about his involvement as a consultant on Blue’s Clues, and describes how the show drew on decades of studies about the success of Sesame Street and other educational programming. For a long time, the conventional wisdom in academia toward educational television held that TV-watching itself was such a passive activity—and the medium so inherently distracting—that there was no way children could derive any benefit from it. But Anderson participated in experiments that showed children would interact with a show if prompted, or if they spotted something on the screen that the host didn’t. The studies also showed that the actual information imparted by these shows mattered more than critics had presumed. Anderson found that “if the shots were in a nonsensical order, if the dialogue was backward, or if the dialogue was in a foreign language,” then the children in the study would stop watching, or they’d complain that the TV was broken. Clearly they weren’t just being stimulated by flicker and sound. They cared about the content. The big question Blue’s Clues’ producers wanted Anderson to help answer was whether it was possible to hold very young children’s attention spans long enough to teach them something that would actually stick. One method Anderson proposed: reducing the edits. His research showed that children have difficulty understanding montage until they get older. A sudden change of location or even camera-angle can break a child’s concentration. That’s why Blue’s Clues looks the way it does, with very few cuts, and with a host who stands in front of a background that changes mainly when he walks or when he “skidoos” to a new place. Little kids (like my easily baffled son) were able to understand where they were at all times, which made it easier for them to follow the story. In “Occupations,” that story involves all the characters in Steve and Blue’s house playing “work.” Much like the screwball ’80s kids show Pee-wee’s Playhouse (and countless other kids’ shows, for that matter), Blue’s Clues is anthropomorphism-tastic, with nearly every animal, appliance, and piece of furniture on screen possessing faces and personalities. As Steve wanders through the house, he finds all his friends in costumes: Side Table is pretending to be a security guard; Slippery Soap is a fisherman; Shovel and Pail are veterinarians; and the Salt and Pepper family have roped various condiments and seasonings into acting as passengers on their imaginary commercial jet. Throughout, Steve plays “Blue’s Clues,” a game that has him looking for Blue’s paw prints on three items, and then trying to figure out what those three clues mean when put together. 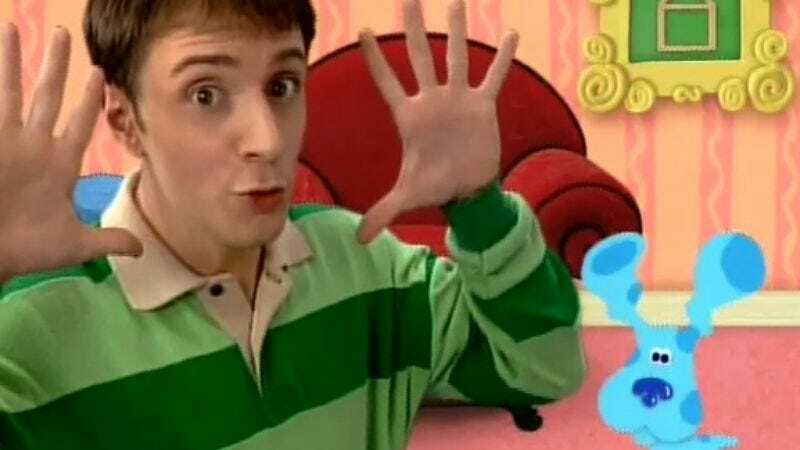 Blue’s Clues produced 142 episodes between ’96 and 2006, and a big part of what made the show such a hit was the playful way Steve—and later his replacement Joe—would interact with the clues. In “Occupations,” for example, after Blue smacks her paw against the screen to indicate that she’d like to play, Steve has to squeegee the print off the glass—a moment that always made my son cackle with laughter. (Actually, anytime a character on television moves beyond breaking the fourth wall to violating the visual rules of the medium, it cracks Archer up, because like a lot of autistic folk, he’s so preoccupied with structure that he finds the “wrong” to be hilarious. This is a problem only at school, where he’ll sometimes laugh at other kids who make mistakes, because he assumes they’re joking.) In the same vein, Steve frequently misunderstands what the offscreen kids are shouting at him, and does so with a charming sincerity, because he wants to sell his young audience on his confusion. If they think they can help, they’re more likely to stay engaged. One of the other great appeals of Blue’s Clues is its sense of continuity. Regular viewers can count on the structure of each episode being more or less identical, built around the playing of the game. In “Occupations,” Steve “skidoos” after Blue into a picture on the wall, which is the show’s standard cue that it’s time for a puzzle. Here, Steve finds Door building a house, and asks the viewers to help remember the names of the people whose respective jobs it is to design the house, build the frame, and put in the pipes. Also in “Occupations,” Steve pauses the Blue’s Clues game to read a letter from a friend—a “letter” that’s really a video—while continuing the theme of the day by playing reporter and interviewing the mailbox. The “skidoo” puzzles and the letters were Blue’s Clues staples, meant to keep children alert throughout the 20-plus minutes it took to play the game. At the end, once Steve has all the clues—a popsicle stick, a stethoscope, and a Band-Aid—he sits down in his “thinking chair” and puts it all together, deducing that Blue would like to pretend to be a doctor. If nothing else, Blue’s Clues teaches kids the fundamentals of reasoning (along with the skill of drawing basic shapes and lines to represent everyday objects). What else could a child get out of Blue’s Clues? Well, some media literacy, for one. By watching Blue, younger viewers could learn to follow a story for 25 minutes. They also—and this is a questionable value for some, I’ll grant—learn to expect television to provide friendly fantasy worlds they could visit every day. Blue’s Clues is bright, non-threatening, and encouraging, with a sense of humor about itself. In fact, when Blue’s Clues first started airing, my wife was stuck at home all day working on her dissertation, and she used to watch the show because she thought it was cute and funny, and a good head-clearer after spending hours writing about dead theologians. The show also authenticates the grown-up world in unexpected ways. The way Steve would sign “thank you” and “smart,” for example, mimicked what we did for Archer before he could talk, and a lot of the show’s other subtle gestures and cues—in terms of language used and topics discussed—extend the real world of the child into the make-believe world of the TV. Certain aspects of real life become more normative when seen on television: the way a home looks, the meals we eat, the rituals of the day, and so on. Plus, these shows expand and explain that world to a child. Because Archer didn’t talk until he was almost 2-and-a-half, we worked on sign language via the Signing Time series of videos, which were helpful not just in teaching him ways to express himself, but in giving him words and classifications for his immediate environment. (These are animals; this is a dog, etc.) Then later, thanks to “Occupations” and other Blue’s Clues episodes, he learned about different jobs, and understood better what adults do that’s different from what kids do. That delineation between kids and adults was a major part of the evolving Nickelodeon mission. I still remember the channel’s early years, in the late ’70s and early ’80s. We didn’t have cable in the main house I lived in when I was a kid, but my dad did, and in the summer when my brother and I would go visit him, we’d occasionally flip past Pinwheel, an anthology of foreign cartoons and live-action sketches that ate up most of Nick’s daytime programming block then. In Nickelodeon’s infancy, the main goal for any cable channel was inclusion in the packages being offered by all of the small, pre-conglomeration cable companies scattered across the country. Nick’s pitch was simple: Cable companies needed to convince the average American family that it was worth paying for television, and one way to do that was to provide the wholesome children’s entertainment that parents largely couldn’t find on broadcast TV any more, thanks to Reagan-era deregulation. As Hendershot notes in her intro to Nickelodeon Nation, in 1969 the FCC ruled that ABC’s kids’ show Hot Wheels was inappropriate because it was essentially a half-hour commercial, but by the mid ’80s, it was hard to find any syndicated or Saturday morning cartoon that wasn’t designed to sell toys. While proto-Nickelodeon succeeded in legitimizing cable TV as a concept, the channel’s actual programming didn’t draw many viewers. That began to change in the mid-’80s, when Geraldine Laybourne took over as Nick’s executive vice-president and general manager. On Laybourne’s watch, Nickelodeon introduced the sloppy, kid-friendly game show Double Dare, and the live-action comedies Clarissa Explains It All and The Adventures Of Pete And Pete. Then when she became president in 1989, Laybourne was instrumental in the creation of Nicktoons, and in the decision to develop shows with strong, creator-driven voices, like the initial Nicktoons trio of Doug, Rugrats, and Ren & Stimpy, all of which sported a wilder look and sensibility than most cartoons on TV at the time (outside of The Simpsons, which was one of Nicktoons’ main inspirations). It was during Laybourne’s tenure that Nick began branding its programming blocks, labeling the preschool-focused shows as “Nick Jr.” and the old sitcom reruns “Nick At Nite,” so that older kids and teenagers could feel free to watch Nickelodeon without suffering the stigma associated with enjoying a channel aimed at toddlers and old people. By the late 1980s, Nickelodeon had clearly honed its “big idea,” a philosophy which could be summed up as “Us versus Them.” The basic idea was that kids lived in a grown-up world, and that it was tough to be a kid when you had to follow all the grown-up rules. Either you were part of “them,’” the authority, and expected kids to be quiet, behave, and follow the rules, or you could be part of “us,” referring to kids, or in this case, Nickelodeon. The “us” believed kids should be free to play around, have fun, and stand up for themselves. Nickelodeon positioned itself as understanding kids, being for kids, giving them what they wanted to see, and giving them a place where they could be kids. To preserve that concept, after launching Nicktoons, the channel promptly fired Ren & Stimpy creator John Kricfalusi for producing cartoons that were too raunchy and adult, because while Nick wanted strong creators, they didn’t want them to be so strong that Nick couldn’t control their content. They wanted to keep their doors open for the next Jim Henson or the next Walt Disney, not the next Ralph Bakshi. One of Laybourne’s main edicts was to create a space where kids didn’t feel obligated to grow up too fast. In an interview with MIT professor Henry Jenkins in Nickelodeon Nation, Laybourne says, “We were going to be a safe harbor where kids could be silly, where they could have a sense of humor, and where there were no double entendre jokes.” Even shows like Blue’s Clues—which tried to teach children life skills, and frequently acknowledged the grown-up world—remained on a level primarily engaging to kids under 5. Some parents have trouble with Nickelodeon’s express partitioning of childhood, with toddlers kept away from pre-teens, pre-teens separated from teens, and all kept clear of adults. But while adults can enjoy the various youth-oriented Nick programming, these shows aren’t for us. If we can appreciate the craft or laugh at a joke, fine, but if we find the art too ugly, the humor too puerile, the music too annoying—well, for the most part, that’s none of our business. Because I write about movies, music, and TV for a living, friends of mine who are parents often pull me aside and ask for advice on children’s entertainment, assuming that I’ll know all the hippest kid-music acts and non-Barney TV. But I don’t, really. In the car, I play the kind of music I like to hear, and in their rooms, my kids listen to the local pop radio station. Early on, my wife and I stocked both of their bookshelves with books and comics we thought they would like, but we’ve always let them choose which ones they wanted to read. And if I don’t like a TV show that my kids like, I go to another room and work while they watch. To be honest, I want my kids to pick out their own shows, the same way I did when I was younger, even if they end up watching the junk that every other child their age is watching (again, the same way I did). I especially want that for Archer, because those kinds of shared media experiences with peers—and not parents—are some of my fondest memories of growing up. Right now, Archer prefers maps, instruction manuals, and books of chess strategy to kid-lit. He can’t talk with his classmates about Star Wars or Transformers or Iron Man, because he’d rather watch videogame-walkthrough clips on YouTube. I love him for all that, and wouldn't want him to be any different. But I still encourage him whenever he shows an interest in the Diary Of A Wimpy Kid books, or Wii games, or Pokémon, because those give him some common ground with his fellow fourth graders—a way in socially, if he chooses to take it. One of the great joys of being a parent is seeing how kids develop their own personalities and interests. For a long time, I could trace back nearly everything Archer said to a book he read, or to a Blue’s Clues episode he’d watched. We had the only 4-year-old in town who talked like a TV host 95 percent of the time, and yet in those learned phrases and behaviors, he was able to communicate his actual needs and feelings. But then one day we sent him off to school, and he started coming back with ideas and turns of phrase that we hadn’t programmed into him. The same thing happened with Cady Gray, but at an even younger age. These days, I’m constantly amazed by what they say and do, because it’s rarely anything I could predict. There are weird toy-constructs in different rooms of the house, and pieces of paper filled with stories, drawings, and games that they’ve come up with on their own. I hear them both sometimes, playing in Archer’s room, pretending to be teachers, or game-show hosts, or Pokémon trainers, or who knows what else? I miss a lot, because—as it should be—the door is closed.